The entire team at Miraglia Catering is dedicated to making yours the best it can be. From our creative event stylists and professional chefs to our friendly and efficient staff, we have been consistently delighting guests for over 70 years. Rely on our knowledge, creativity, and professionalism and let your guests experience the wonderful difference. 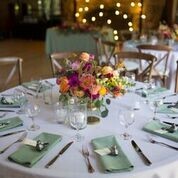 Miraglia Catering: Serving the Greater Bay Area since 1948.